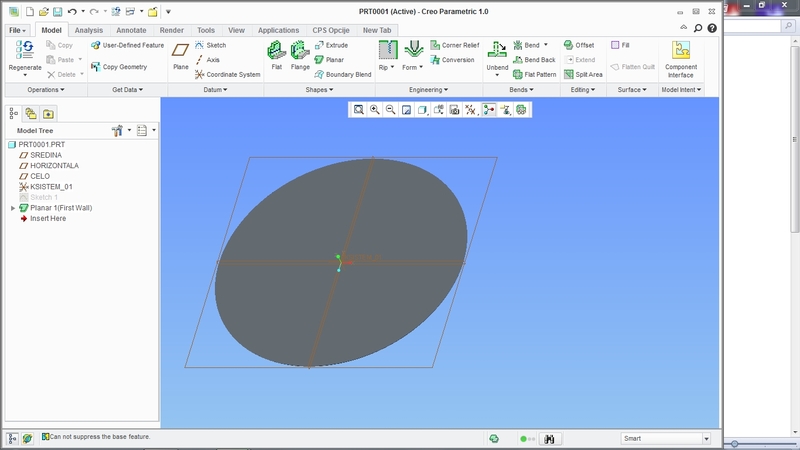 Creo 1.0: Big problems with the new Sheet Metal module. It seems to be impossible to create a Blend Wall in Creo 1.0 unless you make another Sheet Metal feature first. Sometimes, that isn't practical. Pro/E could do this no problem, but in Creo the command isn't always available. Does anyone know how to add a Blend Wall as a First Wall, without starting the part in Sheet Metal mode? You may want to do this if you had Solid or Surface construction geometry. Furthermore, it seems impossible to create a Sheet Metal circle, for example, without converting from Solid. I should be able to start a part in Sheet Metal mode, draw a circle and make that into my first wall, if I so chose. So either way round, Sheet Metal seems to have changed. Can anyone help me out here? Is it an oversight by PTC? Re: Creo 1.0: Big problems with the new Sheet Metal module. I dont quite understand ure problem. I can make circle in sheetmetal and make it into first wall no prob. Well, yeah that's how it used to work in Pro/E. But in Creo 1.0 It won't have it. It will only make planar walls as effectively thin extrusions, so no circles allowed. Sketch (circle) > Done > (select sketch) > Planar > Done > ERROR. Think its prob with your installation of Creo if you get error. Maybe you should take it up with support. I have managed to get a circle at last, but you have to start the part as Sheet Metal. It doesn't work if you start a general part and then convert. Even if you convert straight away. Converting from general works fine too. make sure u pick same sheetmetal thickness as the height of previously extruded circle. Even if you convert before drawing the circle? Yep. But i dont see the diffrence in starting from sheetmetal part and starting from general and then immediately converting to sheemetal before creating anything. Well, no there shouldn't be a difference. I'll see what I can find out. Are on on 32bit or 64bit, Davor? Talking of Sheet Metal, where's the Hem command gone?